The single most potent symbol of Buddhist ritual as performed in Nepal is the Vajracarya priest’s crown. Five examples presented in this exhibition create a cosmic field into which viewers enter, encircled by paintings of ritual performance. 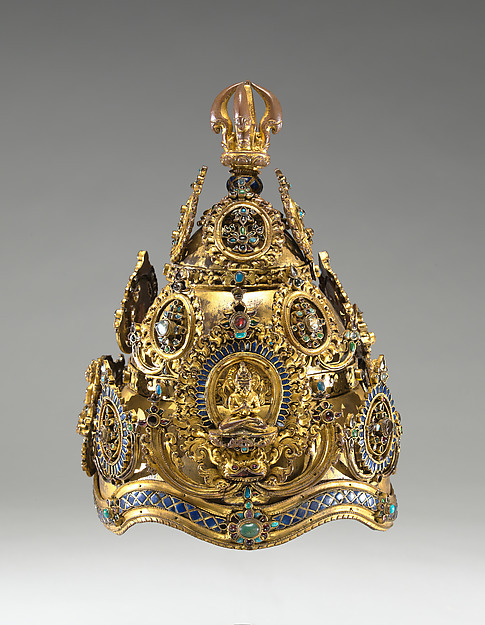 The exhibition is occasioned by the recent acquisition of a superb early Vajracarya crown dating to the 13th or early 14th century; this is joined by an 18th-century crown already in the collection and two others recently discovered in the Department of Arms and Armor. Bronze and wooden ritual utensils, Nepalese cloth paintings, and archival photographs of ritual enactment complete the exhibition.